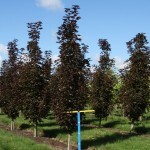 A tightly branched upright tree, with deep maroon foliage throughout the summer. 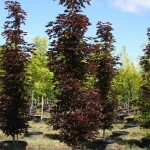 Fall color is a reddish-bronze. It originated as a sport of Crimson King. It is smaller in every respect, including size of the leaves. This species is tolerant of a wide range of urban soils, heat and drought. Often grown low branched.